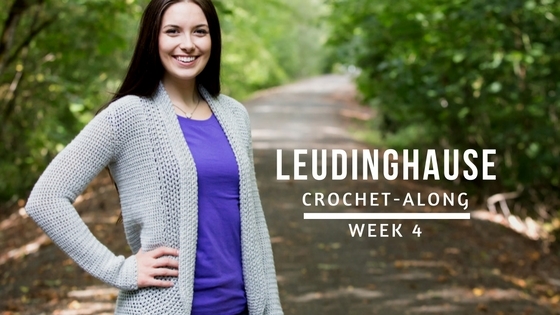 Welcome to Week 4 of the Leudinghause Crochet-Along! This week we will be making the sleeves. (1:04) Round 1 (rs): Fsc 28 (30, 31, 35, 36, 36, 38) join to the first fsc with a slip st.
Repeat round 2 adding an Increase Round (instructions below) on the following rounds until you have 65 total rounds. Sizes XS and S: Add increase round on rounds 5, 10, 15, 20, 25, 30, 35, 40, 45, 50, 55 and 60. Sizes M and L: Add increase round on rounds 5, 8, 13, 16, 21, 24, 29, 32, 37, 40, 45, 48, 53, 56, and 61. Size 1X: Add increase round on rounds 3, 6, 9, 14, 17, 22, 25, 30, 33, 38, 41, 46, 49, 54, 57, and 62. Sizes 2X and 3X: Add increase round on rounds 5, 8, 11, 14, 17, 20, 23, 26, 29, 32, 35, 38, 41, 44, 47, 50, 53, 56, 59 and 62. (4:51) Increase Round: Ch 1, turn, 2 esc in the 1st st, esc in each of the remaining sts, join to the 1st esc with a slip st.
You will end with 40 (42, 46, 50, 52, 56, 58) sts. Repeat round 2 one more time. Don’t forget to make TWO sleeves! I’m so excited because we’re almost done with this cardigan. Next week we just need to block our pieces and sew in the sleeves! Are you ready! ?